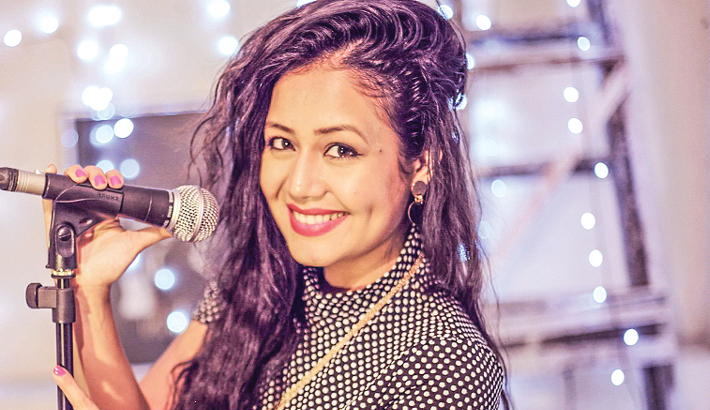 Bollywood singer Neha Kakkar rocked the Dhaka audience with her melodic tune at a musical concert in the capital yesterday. Styled ‘Neha Kakkar Live in Dhaka’, the fabulous musical event was held at the International Convention City Bashundhara (ICCB). Organised by eMakers Bangladesh, local singers also delighted audiences at the event. Neha Kakkar had done a playback for a Bangladeshi film Agnee 2 jointly produced by Bangladesh and India. Neha Kakkar is an Indian playback-singer. She competed on the television reality show ‘Indian Idol Season 2’ in 2006. In 2008, she launched her album titled ‘Neha The Rock Star’ with music composed by Meet Brothers. Her other works include the songs Sunny Sunny, Manali Trance and Aao Raja with singer Honey Singh, Dhating Naach, London Thumakda and Hanju with singer Meiyang Chang , Patt Lainge with singer Gippy Grewal. She was brought up in Delhi and is the sister of singers Sonu Kakkar and Tony Kakkar. Neha Kakkar was a student of class 11 at New Holy Public School, Delhi when she participated in Indian Idol.